its beautifully quiet , set in lush gardens around the most beautiful big pool. I don't normally spend much time at my hotels as they are just a base to sleep and change but I love a day spent around this pool its just heaven.... cool drinks and an ice cream from the bar ... its never crowded. lunch is served under a gorgeous canopy by the pool as is breakfast , it really is a treat. wonderfully positioned ( although for some the walk back up the hill at night could be a little difficult ) but its a stones throw from the pretty town, beach clubs , restaurants and bars. they even all see you off at the gate when you leave ! so lovely. rooms are very basic and small ... if you can .. book the rooms on the roof ! they are much more spacious and a little bit more luxurious. they have a lot of repeat custom which is always nice . The price you found is 21% lower than this hotel's average rate of $141/night. The price you found is 21% lower than this hotel's average rate of $130/night. The price you found is 17% lower than this hotel's average rate of $104/night. This was my first 'family' holiday with our 6 week old baby and the staff couldn't have been any more accommodating if they had tried. Zuhal and Husna (Owner and Manageress) were so attentive to all our needs, and I can’t thank them enough for making our stay so special. 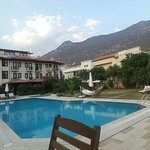 The hotel is a small family run establishment which is extremely cost effective and only a few minute walk from all the bars / restaurants in the heart of Kalkan. We had breakfast and lunch at the hotel each day and it was delicious. Stayed here for a short break whilst attending a family wedding nearby. Owners and staff made me so very welcome and I was touched by their care and helpfulness. Scrupulously clean, comfortable rooms with fresh linen daily - unobtrusive service all combined to make me feel I was in my home away from home. Quiet setting but well located within walking distance of town. Large pool, comfortable loungers and shady garden were delightful. All in all would be more than happy to return to this quaint hotel when next I visit Kalkan. This was our second time at the Asiyan and it was just as wonderful as the first. Zuhal and the family really make you feel at home and relaxed - nothing is too much trouble. The pool and garden are large with plenty of space to just chill out. The breakfast is great and lunch very good value. The rooms are a little bit on the small side but clean and adequate for our needs as you are out and about for the most part. The location of the hotel is also great being only a couple of minutes from the main action - you do not need a taxi like some of the places further up the (steep) hill. We had a really great week and hope to return to Kalkan and the Asiyan in the future. Just returned from a two week stay, what a wonderful find! For us, everything about Asiyan was perfect. Quite a simple set up, making it a very chilled & relaxing place. We couldn't fault the staff, they were the perfect hosts, making us feel like part of the family. We often got some extra treats delivered to our loungers, ice cream, home made cake, baklava....lovely touch. I have read previous reviews about the rooms being small, and yes they're not the biggest, but honestly, who spends time in their room (apart from showering & sleeping) when there's a beautiful pool and amazing weather outside! We had a double superior room which we found adequate enough with plenty of wardrobe and drawer space. Our room was always immaculate and we had clean, fresh linen & towels everyday. This means more to us than the size! If you're considering this for a laid back, friendly, clean stay...do it, you won't be disappointed! We can't wait to return. Stayed at the Asiyan for the second time in the last couple of years and it is still a great little hotel! You feel at home the minute you walk through the gates of the hotel and the staff are welcoming and make you feel like one of the family. Rooms are clean and provide everything you need for a comfortable holiday. Breakfast provides all you need - eggs, cheese, meats, cereals, bread, fruit etc to set you up for the day. The swimming pool and gardens have got to be the main draw of this hotel for us, lovely big pool to swim in and peaceful gardens to relax in - all within a 5 minute walk of the old town. Perfect! Kalkan is a lovely town and one that holds a special place in our hearts, as we first visited the area 15 years ago. Thank you so much to Zuhal and to Husnar for all you have done to make our holiday special once again and we hope to return to Kalkan and Hotel Asiyan very soon.